Did you know that your level of optimism at work can completely your determine both job satisfaction and productivity? It’s true! Studies have proven that people who have generally positive outlooks- both on life and at work- tend to be much happier in their jobs, whether they’re lawyers, plumbers, teachers, or journalists. So what does this mean? There are three types of workers: those that are in jobs they hate but do it in order to get by financially, those that don’t love it but maintain a positive mental attitude to make the day less sufferable, and those that absolutely love their jobs and can’t wait to wake up in the morning to go to work. Take a look at those three categories and ask yourself: which one do I fall under? Now take a look at your motivational drive. Are you working in your current job solely to make a lot of money and get great benefits such as medical, dental, and a 401K? Are you doing it because it is something you enjoy so much that you’d almost be willing to do it for free? Or are you doing it so that you may see improvement, not only in yourself and your workplace, but even on a global scale? By examining these possible motivations, or what I like to call inspirations, it will be easier to target where your problem areas are, as well as where your strengths lie. Once you understand these things, you will be able to better contribute to your company as an employee (or become more inspired as an employer), which leads to a higher quality system of organization and more inspiration to achieve for all. The final factor in regards to positivity in the workplace is that of happiness itself. If you hate your job, it’s not likely that you’re too happy in or out of the workplace. By going in with a positive attitude each day and focusing on aspects that make your position worth staying in, you will gradually notice a change in your feelings for your job. It’s true that not all optimists are much happier than their pessimistic counterparts, but the perception of being happy in their shoes more than makes up for the lack of actual happiness. As the saying goes, “perception is everything.” Also: “you get out of it what you put into it.” If you treat your job like a daily chore, then that’s how it’s going to feel, day in and day out. But if you approach it with an attitude of excitement and continuously seek out new opportunities, then you are more likely to attract exactly that. 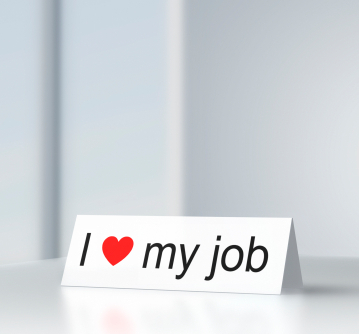 What would it be like for you to look for reasons as to why you like what you do, or why you love your job vs. why you don’t? If you’re new at this, or just out of practice, start small and pick something that might be obvious. Then work your way to those things that may require a little more thought. Before you know, while positivity may not be the answer for everything in life, it can definitely improve your outlook on both life and your career.